The construction of the onshore part of the Balticconnector Estonian-Finnish gas interconnection, which will cost 43.4 million euros and is to be completed in October next year, officially commenced today, on 2 November. Before the symbolic first weld, speeches were made by Kadri Simson, the Minister of Economic Affairs and Infrastructure; Taavi Veskimägi, chairman of the board of Elering; Ants Noot, chairman of the board of Eesti Gaas; and Roland Vaikmäe, the project director for the construction consortium of EG Ehitus, Scanweld and Alvora. The beginning of the construction of the onshore interconnection was celebrated in the place where the offshore and the onshore pipeline join the compressor station on the Pakri Peninsula. Ants Noot, chairman of the board of Eesti Gaas, expressed hope for Balticconnector to contribute to the development of Estonia’s gas market and create opportunities for wider use of environmentally cleaner energy. “Natural gas is one of the fuels with the smallest environmental footprint. Considerable investments have been made in energy security, and the broader natural gas user base is, the easier it will be to cover the investment costs and maintain gas price at the level affordable for consumers,” Noot said, adding that the interconnection will also create a feasible opportunity for connecting the urban areas of Keila and Paldiski to the gas network as well. EG Ehitus, a subsidiary company of Eesti Gaas, is acting as the main construction contractor for the project. The onshore pipeline of Balticconnector will pass through Kiili, Saku and Saue rural municipalities, Keila town and Lääne-Harju rural municipality. The length of the onshore part of the interconnection in Estonia will be 55 kilometers. The pipeline will be assembled from 12-meter-long sections, each weighing 1.8-2.6 tones, and the assembly will require nearly 6,000 welded joints. The onshore part of the pipeline will be completed by the end of October 2019. In some sections of the pipeline, preparation and construction works started in September, and installation will be going on along the entire length of the pipe since the beginning of November. The pipeline will have around 45 crossings with roads, railways and rivers. “One of the most complicated sections, placing the heaviest responsibility on us, is the approximately 15-meter-wide and 4-meter-deep crossing of the pipeline with Keila River in Lääne-Harju rural municipality, which will be completed by means of horizontal directional drilling,” Ahto Aruväli explained. 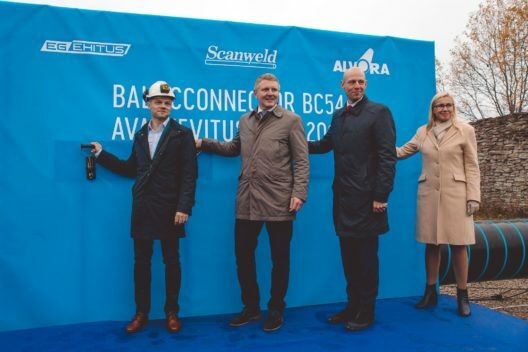 Elering concluded a contract for the construction of the onshore part of Balticconnector with the construction consortium consisting of AS EG Ehitus, AS Scanweld and UAB Alvora in April. Balticconnector will allow the gas market uniting the Baltic States and Finland to be created and gas supply security to be increased. The cost of the construction of the Balticconnector onshore part is 43.4 million euros. The total cost of the project is 300 million euros, of which 206 million will be covered by the European Union.